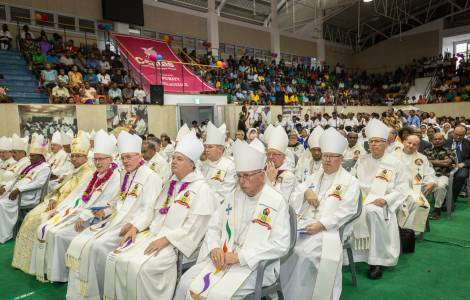 Port Moresby (Agenzia Fides) - "The Church is apostolic because it is based on the teachings and the example of the apostles and on their apostolate. Reading the Acts of the Apostles is a challenge for us, because we are called to emulate these acts": said Cardinal Pietro Parolin, Vatican Secretary of State, who spoke about the importance of "being united in the Church" in his homily of the Mass celebrated with the 80 bishops of Oceania. 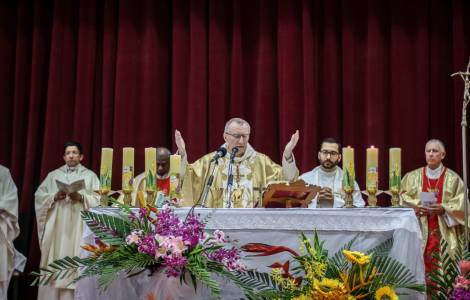 In front of over 2,000 faithful, including priests, religious and laity gathered in the Caritas Technical School of Boroko, in a Eucharist characterized by dances and music of the local tradition, Cardinal Parolin stressed the obedience of the apostles to God, stressing that "obedience to God comes before obedience to man". The Vatican Secretary of State encouraged the faithful to be "obedient to the work of God and to follow in the footsteps of Peter and the apostles".